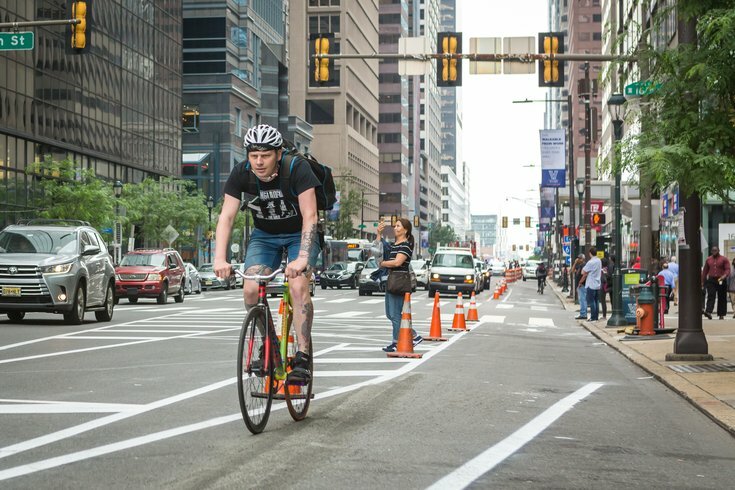 A cyclist rides in the new bike lane on Market Street in Center City. Pennsylvania will spend $49 million on 42 transportation projects across the state, including roughly $12.4 million in funding across six projects in Philadelphia, Gov. Tom Wolf announced Tuesday. Among the money earmarked for projects in Philadelphia is $3 million for major changes along Market Street, between Second and Sixth Streets. The project will reduce four lanes of motor vehicle traffic down to three with the addition of a protected bike lane in each direction. • $3,000,000 is ticketed for the changes to Market Street, called “multimodal safety improvements” in Wolf’s press release. On top of cutting out a lane of vehicular traffic and adding bike lanes, the money also will fund the construction of “floating bus islands” and “pedestrian islands,” and improving two (unspecified) intersections. • $2,682,934 is headed towards “traffic safety improvements” on Parkside Avenue, which the project description notes is a Vision Zero High Injury Corridor. The improvements are supposed to include more pedestrian islands, LED lighting, intersection improvements (at more unspecified intersections), and a new side path. • $900,000 is to be used for eight new bus plazas at four unspecified intersections along Roosevelt Boulevard, in support of SEPTA’s Boulevard Direct project. The final $1.3 million goes to Provco Penrose to construct a Wawa with a gas station on the site of a former heavy metal shredding facility once at the foot of the George C. Platt Memorial Bridge on the border between South and Southwest Philly. Wolf's announcement also mentions the construction of a separate restaurant facility at that location. The full $3 million will pay for the replacement of a 120-year-old timber deck structure supporting the Broad Street entrance to the Navy Yard. The project notes that a failure to replace the structure would close the road completely. The $1.5 million will be used to upgrade two container cranes, replacing the crane drive system and converting the cranes from diesel to electric. You can see a full list of plans for the $49 million in funding here.